The Law Library of Victoria aims to be a modern and comprehensive legal information resource for the judiciary and VCAT and the legal profession. We aim to increase access to justice and support the administration of justice in Victoria by reducing the cost of legal information, enabling access to our renowned collection and delivering outstanding services and engagement with the community. This helps create a more informed and skilled legal profession with lower overheads and reduced costs to clients, improving the affordability of legal professional help for all Victorians. The Law Library of Victoria Strategy 2016-2021 provides clarity for our communities about our priorities for the years ahead. Our vision: We are the preferred resource for the Victorian legal community. We are an aspirational model for other libraries. Our mission: The Law Library provides services that support the administration of justice in Victoria. We improve access to justice for all Victorians by reducing barriers to access to legal resources for our members. 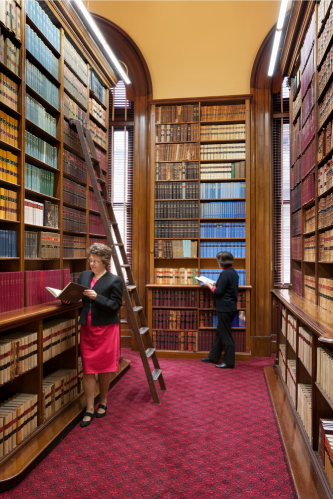 The Law Library of Victoria was awarded Legal Information Service of the Year in 2015 by the Australian Law Librarians’ Association (ALLA) in recognition of the outstanding service we provide. Four strategic priorities, objectives and actions have been identified for the Library in the Law Library Strategy 2016-2021 (PDF, 426KB). Our vision includes being the preferred resource for the Victorian legal profession. We achieve this by building a great website that provides quick, easy access to quality digital information. To become a library service that is an aspirational model for other library services, we continue to improve the way we procure, manage and promote digital resources. We want people to know that when they come to our website, they are visiting our biggest and best library branch - a place where they'll be able to access all their legal information needs, and find all the support required so that they are confident in knowing what information to use, when, and how to find it. The Library implemented a new Collection Policy (PDF, 374KB) in early 2015, updated in 2018, which underpins the management and development of the Library collections. The Library has been working on aligning practices and procedures with this policy. By managing all jurisdictional subscriptions on behalf of the Victorian Courts, the Library gains significant purchasing power and an ability to manage relationships with publishers more strategically. In 2017, our combined buying power resulted in subscription costs that were substantially lower than recommended retail price. In recent years, libraries around the world have had to re-aligned services to new standards and a modern dynamic service environment that requires different capabilities, skills and expertise from our librarians. In this customer-centric and digital world, the librarian is a partner with the business it serves. The Service Framework (PDF, 171KB) builds on our achievements to date, responding to and shaping demand. The Library enhances its reputation for reliable, high-quality services by engaging strategically with the community through a calendar of events. These events, attended each year by many hundreds of Victorians, extend knowledge of Library services and how to access them, as well as providing opportunities for Library members to interact in a collegiate environment. • The Library Strategy is subject to external review every two years to assess progress and refine goals.